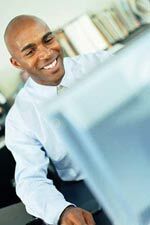 IT or Information Technology Resumes That Get Results from The Write Resume! The Information Technology Field is competitive. Hundreds of individuals are without jobs. The difference between you being selected for an interview from a "cast of thousands" will be the resume you present to the potential employer. We understand "Tech Speak"! The Write Resume can compose and format an interview-winning Information Technology resume which will make you stand out from the crowd. Whether you are a computer programmer, data base administrator or a project manager, we can write a resume which will highlight your strengths and attention to detail that is demanded of professionals in your field. We also specialize in PeopleSoft and ERP resumes, which demand their own unique formats. Information Technology resume writing prices are normally in the Mid-Level or Professional price range. Order an IT Resume Now!